Automotive seating supplier Adient, struggling to overcome operational and launch problems, is still losing money, and it warned Thursday that sales and adjusted earnings will decline this year. But Adient's fiscal first-quarter net loss of $17 million was an improvement from a much steeper net loss of $216 million a year earlier. The Plymouth Township, Mich., automotive supplier said earnings before interest and taxes fell 47 percent to $54 million, while revenue during the fiscal first quarter grew 1.1 percent to $4.15 billion. 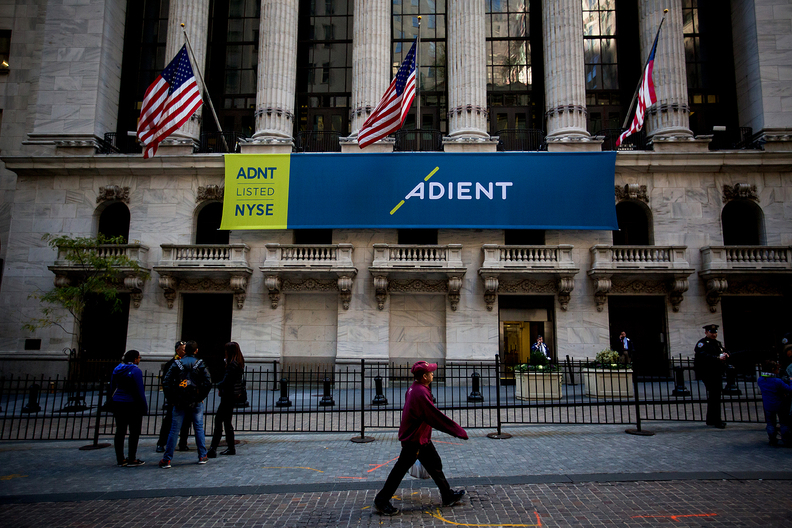 "After completing a comprehensive assessment during the first 100 days of my tenure, there are no structural reasons Adient's margins should not be comparable to its peers," Adient CEO Doug DelGrosso said in a statement. "We are taking actions to improve our financial performance and expect to see improvement in the second half of FY19 compared with first half FY19." Significant operational challenges in the first quarter included launch-related costs and an "uncompetitive cost structure," according to a presentation to analysts by the company, a spin-off of Johnson Controls Inc.
How the company fares in 2019 will depend on delivering on those improvements, analysts said. "We remain cautious on shares given risks around the outlook," Baird Equity Research analysts said in a report. "Sequential improvements in operation performance [are] critical to move stock higher." Adjusted earnings before interest, taxes, depreciation and amortization, which fell 34 percent to $176 million from the same period last year, "continues to be pressured operational inefficiencies," Baird analysts said. The supplier attributed the decline in adjusted earnings to increased freight and operational waste, according the presentation. Adient tweaked its 2019 projections to reflect softer new-vehicle markets in China and a decline in business in Europe. Projected revenue for 2019 will come in between $16.5 billion and $16.7 billion, down from 2018's $17.4 billion. In December, the supplier announced plans to lay off 212 employees at a factory in Charlotte, Mich. Adient will permanently close the location, and layoffs are expected to start March 1. Last June, the supplier abandoned a $100 million plan to move its headquarters to downtown Detroit.